The Motor Vehicle Tax (commonly known as the “Car Tax”) is a property tax collected by each Rhode Island municipality based on the value of each motor vehicle owned. There are three components that determine how much each individual car is taxed: valuation, tax rate and exemption. The valuation of the motor vehicle is set by the Vehicle Value Commission, a state-wide body appointed by the Governor[i]. In all but three Rhode Island towns (Portsmouth, Richmond, and Scituate) each car of a certain year, make, and model are assigned the same value.[ii]. The Commission relies on the National Automobile Dealers Association book value to set the rate, a practice that has been criticized since the valuation ignores both mileage on the vehicle, and the condition of the vehicle. Both these omissions tend to disadvantage low-income Rhode Islanders less able to own and operate low-mileage vehicles in top condition. Changing the valuation (as the Governor’s proposal does) disproportionately helps owners of older, less valuable vehicles, including many lower-income residents. The tax rate is determined by each municipality. In FY2017, the rate ranges from $9.75 per $1,000 value of the car in New Shoreham to $60.00 per $1,000 in Providence, evident in Figure 1. The third component, the exemption level, also varies by municipality. Currently, state law requires municipalities to exempt $500 of the vehicle value. Exemption levels range from the minimum $500 in fifteen municipalities to $6,000 (in seven municipalities) which had been the state-required minimum until 2011 (when fiscal distress resulting from the Great Recession caused the state to reduce the required minimum). The state reimburses the localities for the revenue lost by applying the $500 minimum exemption. The current cost is $10 million in general revenue. Increasing the exemption level would disproportionately help owners of less valuable vehicles since the exemption amount represents a much larger share of a less valuable vehicle’s value. However, owners of lower-value motor vehicles in municipalities that already have a relatively high exemption might not benefit at all from a statewide increase in the exemption. 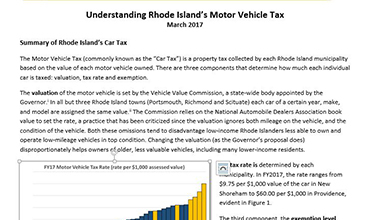 Rhode Island’s car tax structure — particularly the exemption that excludes some low-value vehicles from any motor vehicle tax — is unique in New England. In neighboring Massachusetts, there is a statewide rate of $25 per thousand dollars of assessed value (which is determined based on a declining scale as a percentage of the model year list price of the vehicle). Like Rhode Island, neighboring Connecticut allows each town to set its own rates. In both Maine and New Hampshire, both the rate and the valuation decline with the vehicle’s age. [i] Membership of The Vehicle Value Commission consists of seven members: the Director of the Department of Revenue, five local tax officials, and one motor vehicle dealer. [ii] Motor vehicles in Portsmouth, Richmond & Scituate are assessed at 70%, 80%, & 95%, respectively, of the retail value of the motor vehicle. Motor vehicles in all other municipalities are assessed at 100% the retail value of the motor vehicle in question.